The United States Congress designated the Gunnison Gorge Wilderness (map) in 1999 and it now has a total of 17,784 acres. All of this wilderness is located in Colorado and is managed by the Bureau of Land Management. 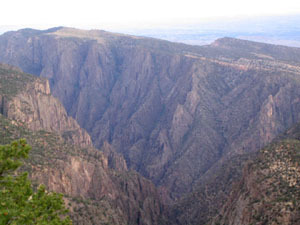 The Gunnison Gorge Wilderness is bordered by the Black Canyon of the Gunnison Wilderness to the southeast. The Gunnison Gorge Wilderness is located in the heart of the Gunnison Gorge National Conservation Area (NCA) within the double canyon of the Gunnison River. Central to this area is the Gunnison River, which enters the Wilderness at the northwestern boundary of the Black Canyon of the Gunnison National Park and extends north to a point approximately one mile downstream from the river's confluence with the Smith Fork, where it leaves the Wilderness. Like all BLM Conservation Lands, the Gunnison Gorge is managed to conserve, protect, and enhance public lands for the benefit and enjoyment of present and future generations. Elevations within the Wilderness boundaries range from 5,100 to 8,100 feet. Winters are usually mild in temperature ranging from 30 to 50 degrees F. Days are generally sunny and bright. Spring and summer time temperatures can be very hot - over 100 degrees. Gunnison Gorge Wilderness receives 10 to 15 inches of precipitation, annually. The legislation establishing the Gunnison Gorge Wilderness provides protection for and mandates BLM's continued management of the area's outstanding wilderness qualities, which include scenic, historic, geologic, and wildlife resources in addition to "unsurpassed" recreational activities including whitewater boating, Gold Medal trout fishing, hiking, and horseback riding. Common wildlife in the Wilderness include mule deer, elk, mountain lion, coyote, ringtail cats, small mammals, neo-tropical birds, raptors, chukar, river otter as weel as rainbow, brown, and cutthroat trout. Sensitive species in the Wilderness include: clay-loving buckwheat, Montrose penstemon, Rocky Mountain thistle, Delta lomatium, Unita Basin hookless cactus, wintering bald eagles, spotted bats, river otters, and kit foxes. There are 17 miles of trail to explore in this wilderness. Planning to Visit the Gunnison Gorge Wilderness? 1. Plan Ahead and Prepare You must obtain a permit and pay a fee for any use of the wilderness. Permits are self-issued at the primary wilderness trailheads (Chukar, Bobcat, Duncan, and Ute). Day-use fees are $3/person. Overnight use is $10/person for one night, $15/person for two nights. The maximum stay length is 2 nights/3 days. The Gunnison River within the wilderness has technical Class IV whitewater. Boaters must have strong whitewater skills. The river access is via a 1.1 mile wilderness trail. All equipment must be hiked in to the put-in, or packed in by horse. A commercial horse-packing service is available from mid-May through September. 2. Travel and Camp on Durable Surfaces All camping in the river corridor is limited to designated campsites. Boaters register for camps at the put-in on the day of the launch. Hikers register at their trailhead on the first day of the trip. 3. Dispose of Waste Properly All trash, including toilet paper, must be packed out. Trash and toilet paper may not be burned. Boaters must carry and use an approved river toilet (groover) or EPA approved disposable bag system such as Wag Bag or Restop 2. Hikers may use the vault toilet at the Chukar campsite, or the primitive toilets at the Duncan camps and Ute Park. Within the river corridor people should urinate directly into the river. 4. Leave What You Find Preserve the past: examine, but do not touch cultural or historic structures and artifacts. Leave rocks, plants and other natural objects as you find them. Avoid introducing or transporting non-native species. Do not build structures, furniture, or dig trenches. 5. Minimize Campfire Impacts Wood fires are prohibited in the wilderness. Charcoal may be used for cooking. A firepan is required for charcoal use. All ashes and coals must be packed out. 6. Respect Wildlife Observe wildlife from a distance. Do not follow or approach them. Never feed animals. Feeding wildlife damages their health, alters natural behaviors, and exposes them to predators and other dangers. Protect wildlife and your food by storing rations and trash securely. Control pets at all times, or leave them at home. Avoid wildlife during sensitive times: mating, nesting, raising young, or winter. 7. Be Considerate of Other Visitors Respect other visitors and protect the quality of their experience. Be courteous. Yield to other users on the trail. Step to the downhill side of the trail when encountering pack stock. Let nature's sounds prevail. Avoid loud voices and noises.